Even amongst this rapid expansion of schools, the establishment of Strathmore High School stands out as a hard fought and difficult process. It was not unusual for schools to open during this period with insufficient buildings to house students. Strathmore was unique in that it not only had no buildings; it had no site on which to build any classrooms. What was then called the Napier Park site (now the grounds of Strathmore Secondary College) had for some time operated as the Napier Park Greyhound Racing Track. Broadmeadows Council, which then included Strathmore in its boundaries, acquired the site in November 1955. 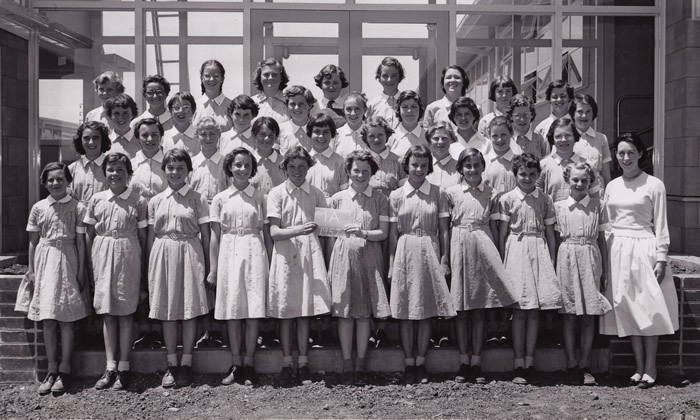 The Victorian Department of Education had been seeking a site for a Girls’ High School. It changed its mind and on November 2 approached Broadmeadows Council and offered to purchase the Napier Park site to be used for a new co-educational High School. The relevant committee of Broadmeadows Council rejected the request in that same month and instead recommended to Council that the land be subdivided into 65 home sites. This recommendation was accepted and road construction work began immediately. The Education Department considered the Napier Park site to be the only suitable site for a secondary school in the district so in February 1956 had an Acquisition Order placed on the site. The Council decided to fight the Department’s order and took out a Supreme Court Writ claiming the acquisition was not in accord with the town-planning act. On Tuesday 6 March the Strathmore State School Committee convened a meeting of representatives from State School Committees at Strathmore, Pascoe Vale South, Oak Park, Coburg West, Raleigh St and Keilor Rd to consider the establishment of a secondary school at Strathmore. The meeting was held under the auspices of Mr Harold Kane M.L.A. and resulted in the formation of a committee to promote a secondary school at Strathmore. Mr R Tabley was elected President and Mr J Dunn Secretary/Treasurer of the committee. Though it had still not acquired any land the Education Department moved to open Strathmore High School in 1957. 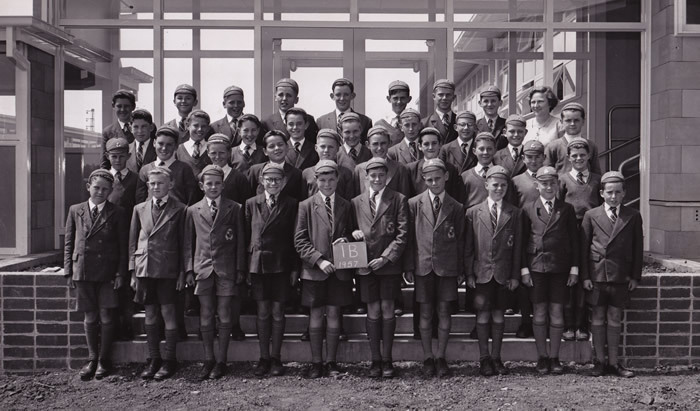 It appointed Mr Ken McGregor the first Headmaster (the title Principal was not used until 1969) and before the end of 1956, 186 students from local state schools had been zoned to the new school. The first classes were held in February 1957 at which time no school existed nor did the Department own land on which one might be built. 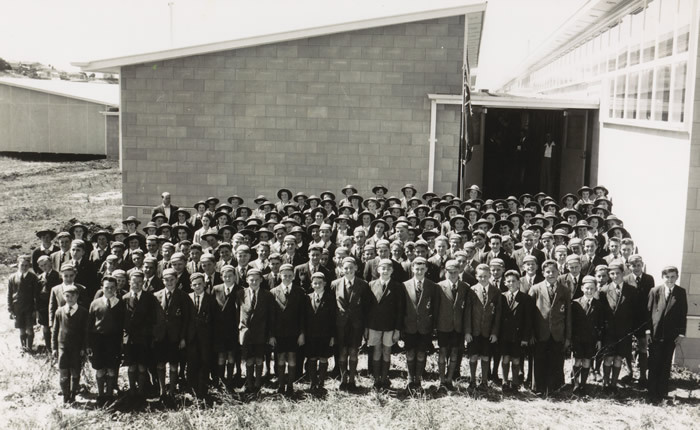 Students attended classes at three locations – the Methodist Hall in Napier St, the Masonic Hall in Mt Alexander Rd and the Essendon State School in Raleigh Rd. In February 1957 the Education Department offered to purchase the Napier Park Site for $60,000, which would cover all council costs expended on the land to date. The Council sought $100,000. Broadmeadows Council met on 8 April with a crowd of several hundred in attendance. Councillor Davy, who had given notice of an intention to sell the Napier Park site to the Department, was refused leave to put the motion. He and four other councillors walked out of the meeting. 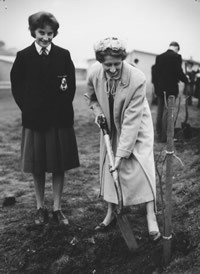 Finally, on 2 May 1957 a special meeting of Council passed a motion selling the site to the Education Department. Strathmore High School finally had a home. By July foundations were already in place and the frames of the first permanent buildings for Strathmore High School were going up. The rapid growth of the school (it had 679 students by 1959) meant that it had out grown these original buildings so it was back to halls for at least some of the time during 1959. 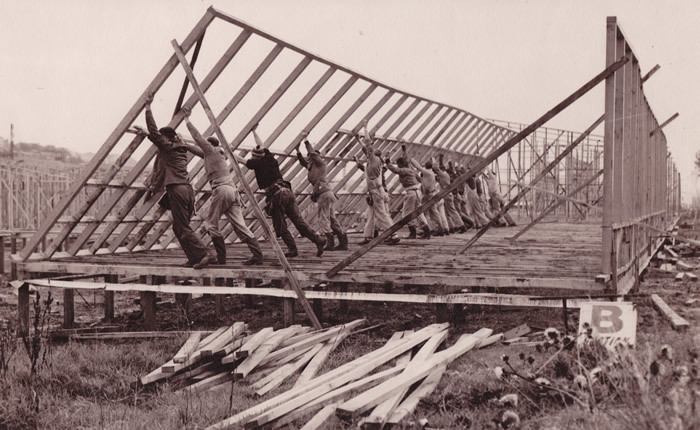 The second stage of building got underway in 1959 and all classes were able to be held tat the old Napier Park site from the start of 1960. 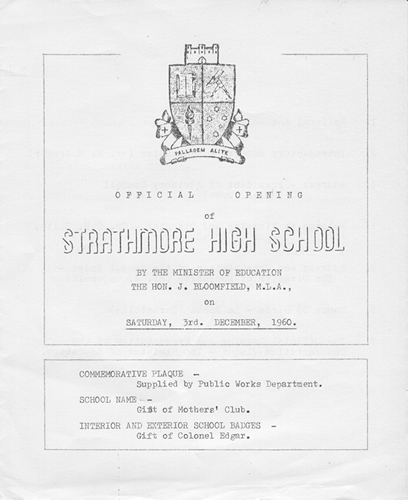 Strathmore High School was officially opened on Saturday 3 December 1960. Minister of Education, the Hon J Bloomfield MLA officiated. The ceremony opened with the singing of the national anthem (God Save the Queen at that time). Mr McGregor spoke as did Mr J Dunn, President of the advisory council. Girls danced the Tarantella and sang 2 songs whilst boys put on a gymnastics display. Head Prefects, Glenys Davies and Neil Day spoke on behalf of students. The official opening also saw an address and presentation of the school badge by the Director of education Mr A McDonnell.